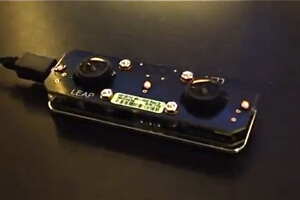 In preparation for launch, thousands of developers are writing Leap-enabled applications using this beta version of the Leap device. Mid-2012, Leap Motion unveiled the most accurate motion sensing technology on the market to date. The Leap detects every subtle finger flick and hand gesture with up to 1/100th of a millimeter precision and then translates it into a movement or command on your computer screen. All that for just $70. A round of Minority Report and Prometheus references ensued—and then a round of skepticism. In June, Singularity Hub covered Leap Motion in depth, including a visit to the Leap Motion offices for a demo and interview with CEO, Michael Buckwald, and CTO, David Holz. The sense is we may be on the cusp of a big change in the way we interact with our computers. Something as revolutionary as the mouse or touchscreen. But to the chagrin of many a tech fan, we won’t find out until Leap Motion’s flagship device, the Leap, ships sometime early this year. So, until then, what else is there to say? Well, as it turns out, quite a lot. At the end of 2012, Leap Motion entered a critical phase—application development. Cutting edge hardware and software are key. But a seamless, simple, mind blowing customer experience out of the box is equally crucial. And blowing minds will be a tall order without a quiver of Leap-enabled applications ready to go at launch. For the inside scoop on app development and the Leap’s upcoming release, Singularity Hub contacted Michael Zagorsek, Vice President of Product Marketing at Leap Motion. Previously, as Director of Marketing Communications at Apple, Zagorsek shepherded Apple’s digital marketing team through the iPhone era. He signed up with Leap Motion in October, 2012. 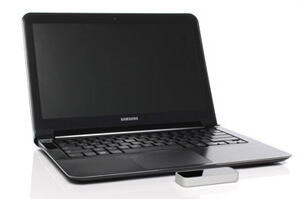 The final Leap configuration may look like this photo from their website, though the 2013 devices will be wired via USB. Why Leap? Zagorsek says he asked himself what got him excited to work for Apple and found he was fired up about Leap for the same reasons. To spur app development, Leap Motion shipped thousands of Leap devices to developers around the world in November—and they were just the ones who qualified for early development based on track record and clarity of ideas. Another 10,000 devices were shipped mid-December. In all, forty thousand developers applied to the program, and Leap says they aim to eventually accept all applications. Overwhelming community interest? Check. But the developer program is also indicative of Leap values. In the video, the LabVIEW hackers challenged each other to a 24-hour race to coolest Leap application. Pretty fast, right? Sure. It’s early days yet. But two things stand out. First, developers are providing independent verification the technology is very precise. Second, the device appears to allow for rapid app development. And that bodes well for the 2013 release. In parallel to application development, Leap is moving forward with production. The firm recently announced $30 million in Series B funding to scale manufacturing for the launch and a new partnership with ASUS that will bundle the Leap device with high-end notebooks and All-in-One (AiO) PCs later in the year. The launch date is still early 2013—likely in February or March. But there’s a little flexibility there. “We wouldn’t let something like a few weeks get in the way of delivering what we think is an amazing experience. What will we use our hands to control in the future? Gaming, 3D design and modeling, music—or simply our computer desktop. Like a touchscreen minus the touch. But ideas like these are potentially only the first wave. Take the LabVIEW hackers example. National Instruments LabVIEW system design software has been used to build programs for technical engineering applications at the Large Hadron Collider, SpaceX, and the LEGO Education robotics platform. So…gesture controlled space-walking repair robots? Gesture controlled surgical robots? Humans conducting industrial machinery like a symphony orchestra? The mind runs wild.